Last chance – act now to stop Bernard McNamee! If you’re one of the more than 27,000 people who have already signed on to our public call to stop Bernard McNamee, Thank you. (if not sign here) But now I need your help to delay, and possibly derail McNamee’s nomination. 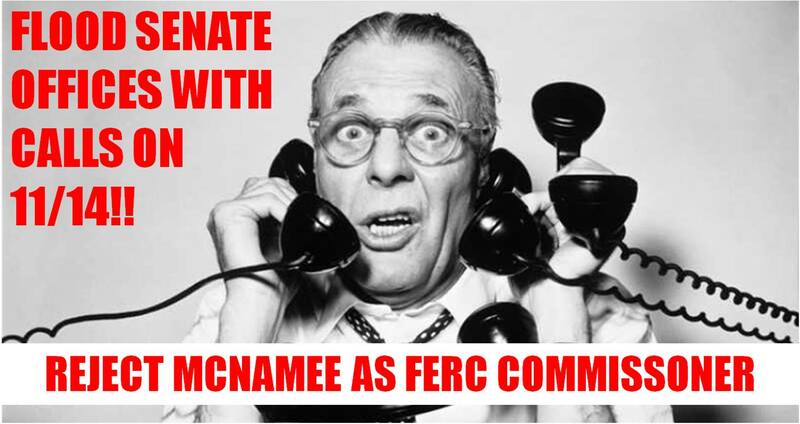 Many of you have already called the Senate Energy Committee to opposed McNamee (thanks again! ), but new evidence has come to light and the Democrats on that committee are asking to delay McNamee’s vote on Nov. 27th. In between stints at the Department of Energy, McNamee worked for a right wing thing tank funded by the Koch brothers and Exxon called the Texas Public Policy Foundation (TPPF). In that speech McNamee falsely claims renewable energy “screws up” the grid and environmental groups want to “return us to … administrative tyranny.” TPPF tried to delete the video, but some enterprising reporters dug up a copy, and a pro-renewables think tank released the whole thing last week while the Senate was on Thanksgiving recess. 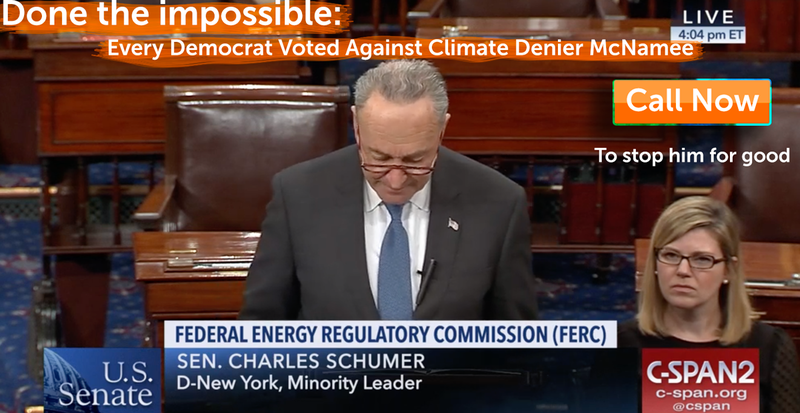 Now, the Democrats on the Senate Energy and Natural Resources Committee (SENRC) say they need time to review this new evidence and ask McNamee questions about it before they can vote. The whole thing is so damning that even Republican former FERC officials and conservative lawyers say that it should disqualify McNamee, but Lisa Murkowski, the Republican chair of the committee is pushing ahead with a vote! Can you call the Committee at (202) 224-4971 right now and ask them to cancel the vote and reject Mcnamee’s nomination? Bernard McNamee is a dangerous nominee – he’s corrupt, unqualified, a climate-denier and part of Trump’s plan to force ratepayers to bail out coal and nuclear power. His nomination should be withdrawn and this committee meeting to vote on him should be canceled. If the hearing proceeds, Senators MUST vote NO on his nomination, and must ensure that all votes are recorded. No unanimous consent or procedural gimmicks (that’s how we got the last three Republican FERC commissioners). Already called or ready for more? Click here for the instructions from 2 weeks ago on how to call through all the members of the committee and ask each of them to vote no! Only the hearing date has changed, all the other info is still pertinent. PPS – friends from BXE will be in the hearing room tomorrow – if it goes ahead. Click here to stay tuned to their Facebook page for updates after 10 am eastern tomorrow. Next month, representatives from every country in the world will meet to decide how to implement the Paris Agreement at the COP24 UN climate talks. 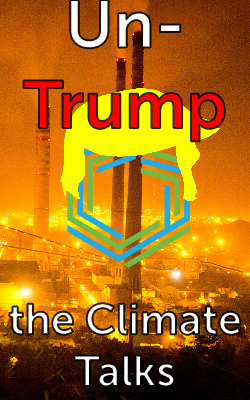 Donald Trump is the only world leader to have rejected the agreement, and the science of Climate Change. 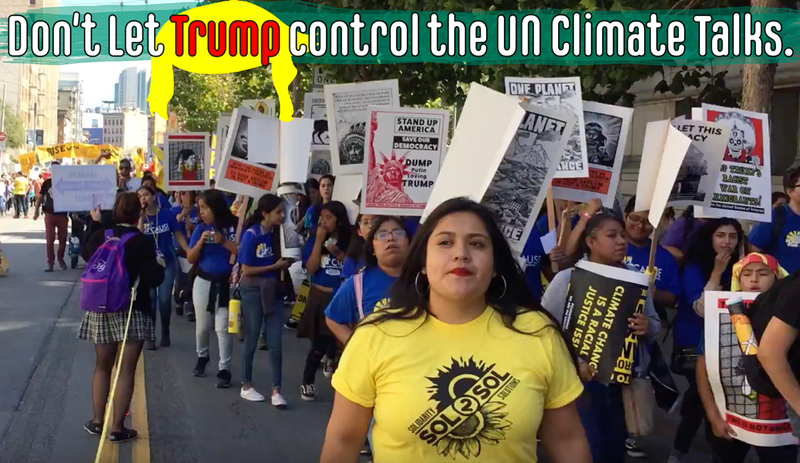 And Trump is coordinating with fossil fuel companies, polluters and dictators to block progress at the climate talks. The most recent report from UN Scientists clearly shows that we have only 12 years to achieve a massive transformation in our entire energy economy.​ The People’s Demands for Climate Justice is one such solution. And I need your help to make sure it’s seen and read by all the delegates before millions of people around the world experience climate devastation. We need to show that people everywhere, including in the U.S., widely echo and support these demands. Please add your name now to demonstrate your support​ — and to ensure that the Paris Agreement isn’t weakened by Trump and his fossil-fuel cronies. If you’re one of more than 25,000 people who signed on to block McNamee -THANK YOU. Together with allies we’ve already delivered your signature and lobbied every member of the committee to vote no. And thanks to you we’ve got a chance to stop the nomination: But we have to act fast. Every day, new corruption and malfeasance about McNamee emerges – the kind of scandals and abuses of power that could convince Senators to block him. McNamee’s only chance to get confirmed is if nobody notices or asks questions. So we need your help to make sure that doesn’t happen. Can you make a call or send a tweet (they answer them like calls) to members of the Senate Natural Resources Commitee before the hearing tomorrow morning? Click the link to see a list of all the Senators on the committee and their contact info. If you have a Senator on the committee, call them first, but don’t worry if your Senator isn’t on the list. Call as many Senators on this list as you can. Start with the Chair, Lisa Murkowski and the Ranking member, Maria Cantwell. 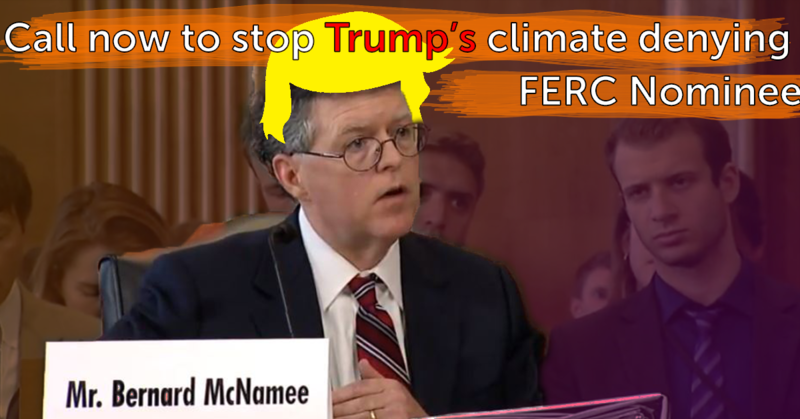 Bernard McNamee is a dangerous nominee – he’s corrupt, unqualified, a climate-denier and part of Trump’s plan to force ratepayers to bail out coal and nuclear power. His nomination should be withdrawn and this committee hearing canceled. McNamee’s nomination is obviously be part of a plan to ram through more fossil fuels. And FERC’s Republican majority is clearly complicit. But we can stop them if we make calls today, and Senators get serious at the hearing tomorrow. I’ll be there to do everything I can to make sure they do – now I need you to make a call to back me up. Or check out our longer piece on McNamee. OR check out the excellent explainer on McNamee from our friend Karen Feridun at Berks Gas truth. 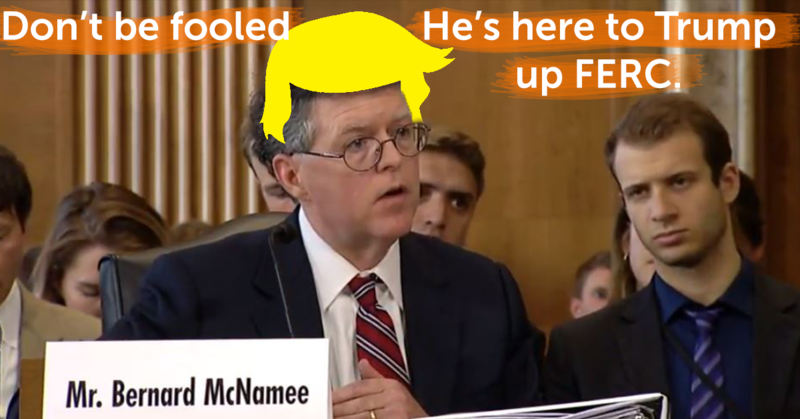 Donald Trump has nominated Bernard McNamee – a deeply unqualified, republican-hack, and climate-denier – to fill the vacant Republican seat at the Federal Energy Regulatory commission (FERC). The Senate is moving at “warp speed” to ram this latest dastardly, destructive nomination through. McNamee’s confirmation hearing has been scheduled for November 15 at 10am. We’re headed to DC now with friends from Beyond Extreme Energy (BXE) to deliver more than 13,000 signatures opposing McNamee. If you haven’t signed yet, now’s the time! 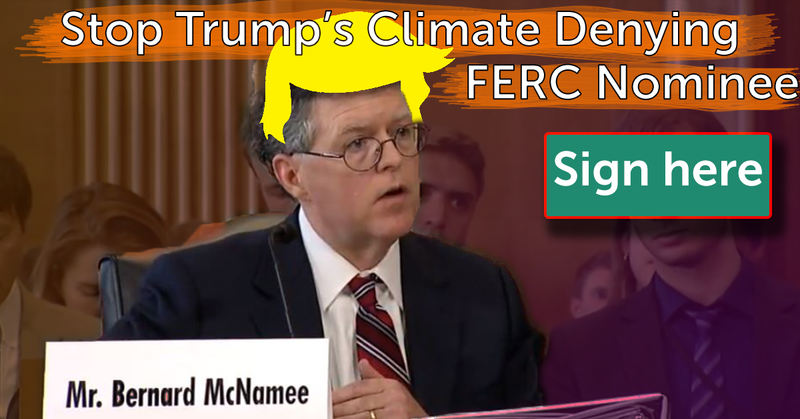 If you agree that we can’t afford one more climate-denying Trump nominee in charge of our energy policy, sign here to tell the Senate: vote NO on McNamee and stop Trump’s FERC! I wrote a longer piece with more footnotes and references that make the case for why and how Trump is stacking FERC with partisan fossil fuel warriors. 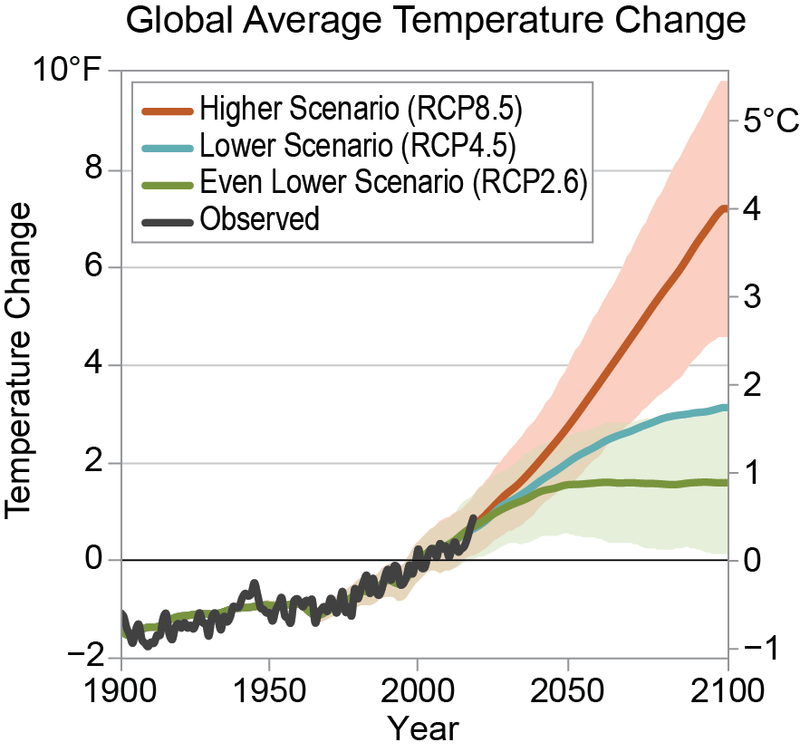 Check it out and keep telling everyone that this is not normal, it is not ok, and it is essential that we take action in this time of climate crisis. You may also want to check out the excellent explainer on McNamee from our friend Karen Feridun at Berks Gas truth. Just a quick update to let you know that U.S. District Court Judge Brian Morris has thrown out the permit for the Keystone XL pipeline. It’s obviously a huge victory for all of us who have been fighting this zombie pipeline, even as trump keeps re-ordering it back to life. Judge Morris’ order tells TransCanada to cease all pre-construction for the project – meaning that the pipeline is on hold and any construction would be illegal. It does not mean that the pipeline can’t be re-started. And of course we’ve seen time and again that TransCanada and other pipeline construction companies will routinely violate the law and begin construction – intending to pay whatever paltry fine the Trump administration assess on them later as a “cost of business.” We must remain vigilant – and we’re encouraging everyone to sign and share the Pledge to protect – simply put a promise to show up, throw down, and block all pipeline construction if it starts again and we’re called upon by local indigenous leaders and land holders. But what’s really exciting is that this ruling says that Trump can’t just dismiss the findings from the Obama Administration that stopped the pipeline. Those findings, remember, also included a specific reference to the climate impacts of the pipeline – the first time a US President had rejected a pipeline like this because of Climate Change. All of which means, if Trump wants ot un-do the Obama pipeline decision, he’s got to go back and at least look at the climate impacts of keystone XL – which we know will be massive, and which he cannot legally ignore or lie about any longer. Since Trump first issued a ‘Presidential permit’ for the pipeline and Nebraska commissioners granted a statewide permit for an alternate route Indigenous leaders, rural landowners, and environmental organizations have been suing to stop them. This is a big win for those groups and we’re proud to celebrate with them. 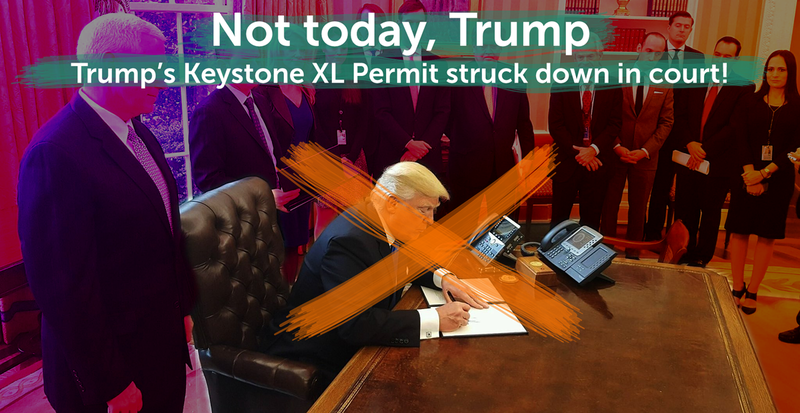 But, we know that this isn’t the end of the fight to stop Keystone XL, and that’s why more than 17,000 of us have pledged to take action if construction begins. Join us today, sign the pledge to protect. And congratulations again on a well-deserved victory.